I started calling it the Invisible Binding because I had no idea what it was called. Then, someone left a comment calling it a Knife Edge Binding and that she had seen it demonstrated on a Fons & Porter television episode. Also, in the book Art Quilt Workbook it is called a No-Binding Binding. 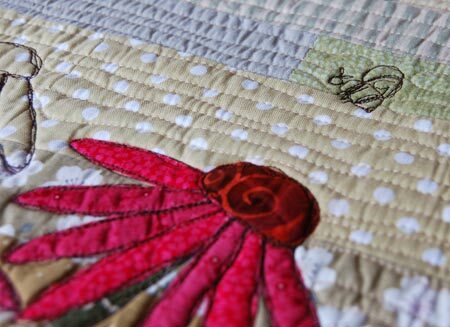 Although, the Art Quilt Workbook uses one layer of fabric and I double the fabric. Whatever it is called… it’s a perfect finish for an art quilt. It lets the quilt be finished without calling attention to the edge where a normal binding would stand out. It also seems to lay flatter – which is an added plus for art quilts. So, here we go. Without further ado, presenting the Knife Edge Binding. 1. 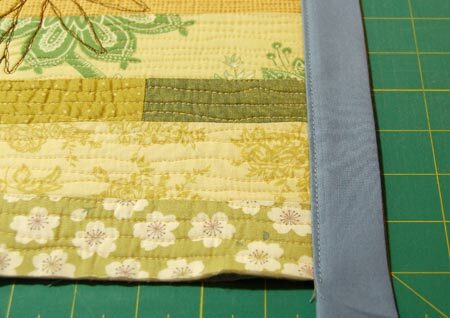 Trim your quilt edges so that they are straight and the corners are square. 2. 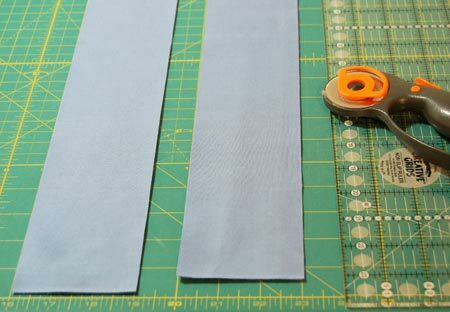 Cut 3″ strips of fabric that are at least 2-3″ longer than the edges of your quilt. My quilt measured a little more than 19 inches. So I cut my strips about 22-23 inches long. 3. Fold each strip in half lengthwise so that it is now 1 1/2-inches wide and press. 4. 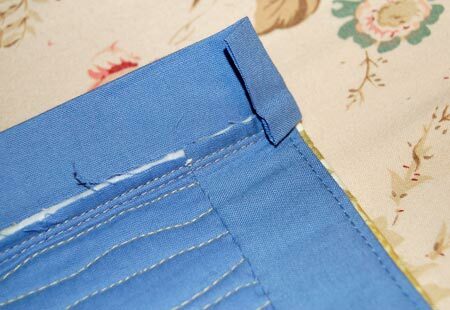 Sew the raw edge of the binding to the top of your quilt on the two opposite sides. 5. 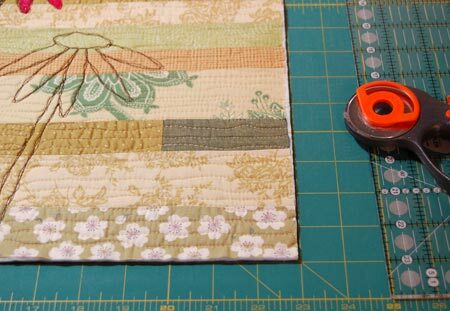 Press the binding to the outside edge of the quilt. 6. This is the most important step! 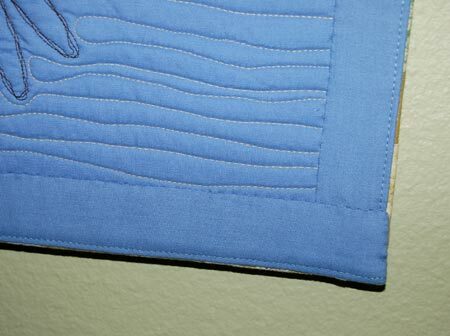 Stitch closely, about 1/8-inch, from the seam created by sewing the binding to the quilt. In clothing construction this is called “under-stitching.” It is used on necklines, facings, under collars and anywhere you want the fabric to fold over smoothly and lay flat. This is what helps the binding fold over to the back of the quilt and make a nice smooth edge on your quilt without the it showing on the front. Skip this step and you will never be able to fully hide the binding. 7. Now, once the binding is under-stitched, press it to the back of the quilt with lots of steam. Pin and sew to the back of the quilt. I use a slip stitch when sewing binding. 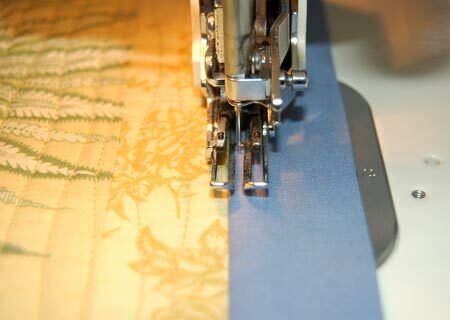 But many people use the overhand stitch – which is the same stitch that is used in hand appliqué. I like the slip stitch because the thread is buried and not visible. In the hand appliqué, the thread is still slightly visible. Whatever you do… do what is comfortable for you. 8. 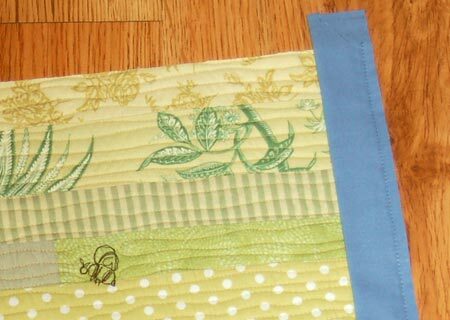 Once the two sides are done, trim off the excess fabric on the ends and sew the remaining two binding strips to the top and bottom of the quilt. 9. Press, under-stitch and press to the back side of the quilt. 10. Turn in the edges to hide the raw edges of the binding. You may have to trim off some of the excess fabric to make it all fit and lay smoothly. 11. Hand sew the binding down from one corner to the other. Voila! It is finished! And… I am loving these little quilts. It is using up some of my scraps, though not quite fast enough. (No new fabric was harmed in the making of this quilt.) And they are fairly quick to make. Now… let me see your Little Quilts and Knife Edge Bindings. Oh thank you. 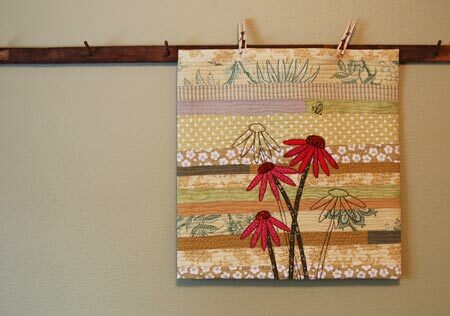 I have some old quilt blocks and I think this is a wonderful way to finish them. Now to just find a few more hours in each day. I love the little quilt you made!! I will print this and try it out. Thanks, Anita. Thanks very much for the info! I’ll be trying this out myself! Very cute little quilt. I’ve also heard that finish called facing the quilt. Which makes sense since it is much like facing a garment. Thanks for the tutorial. Ohh..love the tutorial! Thanks for sharing this. I can’t wait to try it out. It took me a little bit to absorb this, (what can I say, I’m slow! ), but I think I got it, and can’t wait to try it! Perfect! Just perfect! Do you do large quilts with this method too? I haven’t sewn in forever. But that is a super neat looking binding. Check out this tutorial on Melody Johnson’s blog. She uses a mitred facing which has the virtue of reducing the number of fabric layers (and therefore bulk) in the corners. that was so amazing, very lovely. THANK YOU! just the look I need for a challenge quilt that due too soon… *mwah*! I’ve been wanting to do a binding like that but I’ve never seen the technique demonstrated. Thank you for the great photos! thanks for the tutorial on binding this way! i’ve been making mini quilts and i agree, it’s a perfect binding for them. i will be trying this soon! Thanks for this great tutorial. Something I always wondered how to do. Also a good hint for using this one stitch also for cloth sewing. herzlichen Dank für diese gute Anleitung. Thank you for this great tutorial. Now I finally finished my quilt. oh! piecefulchaos pointed me to your tute, what a clever thing. i have never heard of this before. how is that possible?? has this been around forever? your mini is simply stunning!!! I think this is so perfect…can’t wait to try..thank you! I was looking for how to make a mug rug and I found your blog. Thank you! It have been really helpful! thanks very much for this lesson, has given me food for thought on how to finish my grandmothers flower garden quilt. Thankyou so much for the tutorial. I am sure going to try it. I just made a “Strata Star” & I’m going to see if that will work on it. I know this technique as a faced binding, but I agree, it is the perfect finish for certain quilts! Beautiful job on the binding! Great photos and easy to understand. However, I am a bit OCD and wanted to comment on something in your directions. 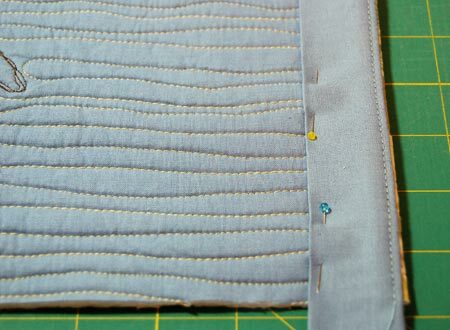 In step 6 you referred to the top stitching near the seam as “stay stitching”. It is actually called understitching. This technique is used to keep facings and linings from rolling to the outside, which is why it works so well for your application. You’ll find it on any well made garment where a facing or lining is used. Stay stitching is normally a basting stitch that you sew on curved areas of your fabric pieces (like raw neck edges, and facings) before constructing a garment. The purpose is to keep your curved areas from stretching or distorting during garment construction. I hope I haven’t offended you. I have been sewing for over 46 years and started out in garment construction. I don’t know it all, but I do know a lot. LOL! I enjoyed your tutorial and will come back to see what else you’ve been up to. Happy quilting! I really like the hidden binding in this technique. Nice job on the tutorial and your work is beautiful! Thanks for sharing! 😦 I’m 10 years too late to see the pictures!! Drat! Going to follow so I don’t miss anything else! You are currently reading Knife Edge Binding at Bloomin' Workshop.